If we needed any confirmation of the fact (which we don't), at least we have solid evidence that naïveté can be a group activity. 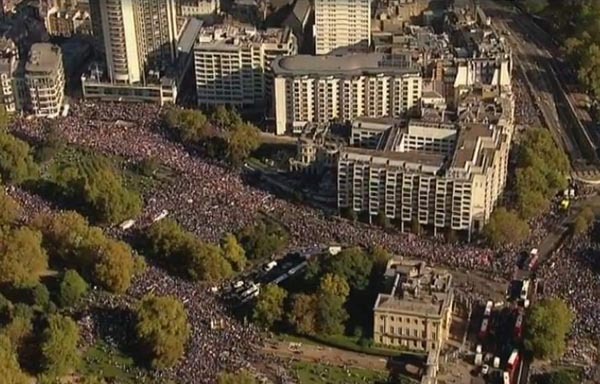 That much is evident from the thousands who turned up in London yesterday for the so-called "People's Vote" march, calling for something they aren't going to get and wouldn't know what to do with it if they did. There is also arrogance in the presumption in calling for a "People's Vote", as if that somehow legitimised the action and gave it popular force. This is from the same wellspring as the Russian Soviet conspirators who called their movement the Bolsheviks, misrepresenting themselves as the majority, when they were a tiny, self-serving faction with their own agenda. Whatever the likes of Matthew Parris might say, the fact is that there isn't time for another referendum. There isn't the infrastructure in place and it would be very hard to put together coherent campaign groups which could properly fight the propositions in such a way as to make for a meaningful vote – presupposing that the media could report it properly. It would be harder still to define what the propositions might be and then get a significant number of people from each camp who understood them. And, given how the failures of the last referendum campaigns, the very last thing we need is a repeat which leaves both sides unsatisfied. Even with the simplest scenario, there are unresolvable problems. That would call for a plain "yes" or "no" to the government's deal – if finally it agrees one. The trouble with that is that the consequences of a "no" vote is a no deal. There is no provision in Article 50 for going back and re-opening the negotiations and bashing on until a new deal is agreed. Thus, in a straightforward referendum, the choice would be between a deal and "no deal", except if the government had elected for a "no deal", in which case our choice would be "no deal" or "no deal". This is something on which I have remarked before – yet it still doesn't seem to sink in. The "no deal" scenario is the default position. If the deal isn't agreed and ratified by 29 March 2019, then we drop out of the EU without a deal. And while it is theoretically possible to extend the Article 50 two-year period, we cannot rely on this. It requires the unanimous agreement of all 28 Member States. On this, one has step back just a little bit. Let us imagine a scenario where the EU and the UK have hammered out a laborious agreement. Does anybody seriously think that the EU is then going to give the UK another six months so that it can have a referendum which might unstitch the deal? Furthermore, it is not as if we have an overwhelming choice. Should the UK dump whatever deal is agreed, there is not exactly a multitude of alternatives waiting in the wings. Even if we pick one, we then have to look at a scenario where the EU (either the Council or Parliament) reject it, in the unlikely event that negotiations are reopened. Yet, one gets sees from their website that this is not really of any concern to the People's vote campaign. It wants tacked on another vote asking people if leaving the EU is what "they really want". Thus, the Brexit failure is to be used as the excuse for re-joining the EU. It then has to be assumed that the government can withdraw its Article 50 notification – which rather depends on whether the ECJ accepts that this is a valid option. But, if it does not, we have the Article 49 entry procedure to follow – at this time, the most likely option. With that, there's not a lot of thinking going on. Doubtless, the European Union would require new conditions if we sought to re-join – such as a commitment to join the euro. It would almost certainly remove the rebate and many of our current opt-outs. And therein lies a contradiction: the "democratic" imperative that had required a "second" referendum would surely demand a third, for the "people" to approve any new membership terms. The age of the "neverendum" would be upon us. The sad irony of this, of course, is that much of what the remainers think they might want could be satisfied by continued participation in the EEA – the very option Mrs May and her predecessors (and both the official campaigns) were keen to reject. Thus, if the failed "remain" campaign had put some of its weight behind the "Norway option" after the June 2016 referendum, instead of this fatuous call for another referendum, we might be getting somewhere. But it didn't – and for reasons that are utterly transparent. Hiding behind its call for a referendum on the Brexit deal, it is a thoroughly dishonest campaign which has as its real aim the reversal of the verdict of the June 2016 referendum, one which it dare not declare openly. Behind that, of course, stands an essential truth that most remainers either choose to ignore, or simply cannot deal with and go into denial when confronted with it. That truth is quite simply that the EU and its precursor organisations were established for the purpose of promoting European political integration – eventually to create a United States of Europe. And, given that the politicians and supporters of this objective had no democratic mandate for it, the founders sought to use economic integration as an indirect means of achieving their aims. This is the essence of what is known as engrenage or the Monnet method. However, there are those who would argue that this was once the objective, but it is no longer – which can hardly be true when the EU is still seeking to develop an economic government to manage the euro – the single currency itself being an intensely political project, the primary aim of which was to further political integration. It really doesn't matter, therefore, how many people march on the streets of London. There are those of us who regard the central aim of the EU as illegitimate and we want no part of it. This brings us into Booker territory for, in this week's column he observes that, when we finally get around to an inquest on why we made such an unholy mess of Brexit, we may discover that the core problem was that the British never really grasped the true nature of the "European club" they had been part of for 45 years. The thing is that the treaty-based rules were designed to have a ratchet effect, pulling us into the maw of political integration and preventing any backsliding. The EU (and the EEC before it) was always more than a trading association and its dual-purpose rules always had as their primary objective political integration. Yet, in their haste to justify UK membership, successive prime ministers – starting with Edward Heath, have sought to convince us that we joined a trading agreement. And, throughout the decades, successive generations of (mainly) Tory MPs have deluded themselves that this is the case. Where a political agenda is acknowledged, the core narrative revolves round the idea that we initially joined a trading agreement which somehow lost its way, and started to pursue a more rigorous political agenda. Thus it was believed that, to restore equilibrium, all we had to do was convince the "colleagues" to revert to the supposedly original idea of a trading agreement, and all would be well with the world. This delusion, as much as anything else, explains why the political classes never understood why our decision to leave not just the EU but also the wider European Economic Area made border controls inevitable, not just in Ireland but with the rest of the EU. It also explains, says Booker, why Theresa May and her ministers vainly traipsed around other governments in Europe, trying to get them to persuade Michel Barnier to give us more favourable terms, when the whole point was that, under the rules, they had given Mr Barnier full responsibility for negotiating on the EU's behalf, on which they had no power to intervene. And because Barnier is protecting the political structures of the EU, it explains why, when he and the Commission repeatedly tried to set out the legal consequences of Britain's decision to become a "third country" and thus exclude itself from "frictionless" access to our largest export market, it was a dialogue of the deaf. The British could not begin to understand the implications of what they were being told until it was too late. This was a fatal misunderstanding because it meant that we were simply unaware of how much of our national activity had become so closely intermeshed with that of the EU and thus legally dependent on its rules. We were unwittingly putting at risk so much of what we had come to take for granted, including "frictionless" access to that market which provides one pound in every eight we earn as a nation. The consequences for many of our most successful industries may thus be devastating: from chemicals, pharmaceuticals, financial services, aviation and our ports to Formula One motor racing: even our ability to move racehorses freely between Britain, Ireland and France. All these and many more are now, to a greater or lesser extent, dependent on those EU rules from which we have chosen to exclude ourselves. Virtually none of this was known to any of our politicians when the story began, which is why we have landed ourselves in the impasse we see today, where neither side can move from its entrenched position. Yet, as Booker has said many times before, most of this could have been avoided if only we had left the EU but remained like Norway in the EEA, to continue trading much as we do now. And certainly the potentially disastrous shambles that we currently face was not what most of us thought we were voting for in 2016. Nevertheless, the People's Vote supporters need to realise that their basic stratagem is flawed. They're not marching, as is claimed by some "to save the NHS, the NI peace process, the integrity of democracy, their rights, freedoms, and the future of their country". Whether unwittingly or not, they are seeking to keep us locked in a political union, the membership of which has no political legitimacy in this country. This does not prevent us agreeing that Mrs May is making an unholy mess of Brexit. But that does not legitimise remaining in a political union. Still less does even 700,000 marching in the streets of London overturn the decision made after the largest turnout in UK electoral history. The answer to a botched Brexit it to improve government performance and make democracy work.